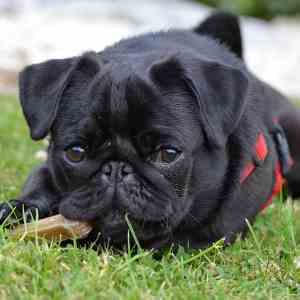 Does your new puppy need a clever black dog name? Sure, why not. 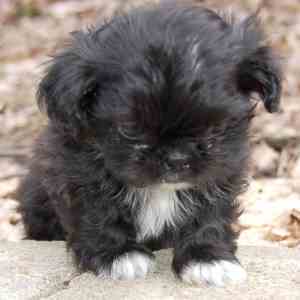 Every puppy deserves the perfect name and many people will choose a name based on the color of the fur or hair. 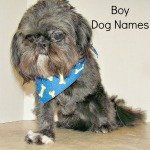 There are many ways to choose a name for a small dog, but finding a name that reflects the color of his/her hair is a popular choice. We have compiled a list of possible names for your black dog. Where does the inspiration come from for these black names? Consider all the black objects found in nature, either in the form of animals, plants and minerals. Any animals that have black fur, fins or feathers, were fair game and added to the list. You’ll also find names borrowed for languages other than English which might be an idea choice if your heritage lends itself to a non English name. You’ll find names from books, folklore, and the movies. Many people choose a name based on their favorite celebrity while others have a favorite character they remember from their childhood. My favorites come from edible (or drinkable) sources, but those are few and far between because people just don’t eat many black things. Some of the names may be appropriate for a girl and others for a boy, and some would be fine for either. We’ll let you be the judge of that. 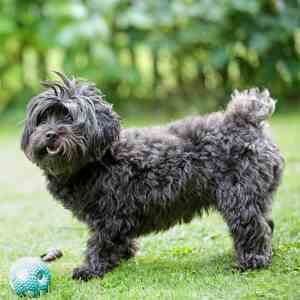 Does your dog have black and white hair? 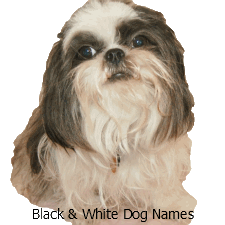 Check out our black and white dog names for some more suggestions. 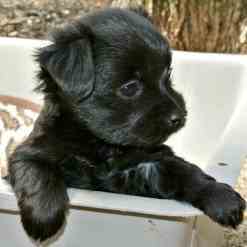 Got Some Great Ideas for Black Dog Names? 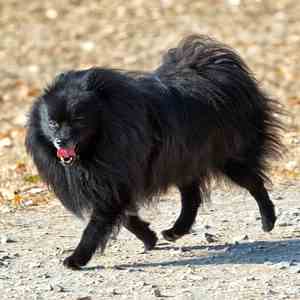 We want to make this the longest Black Dog Names List ever. If I have forgotten a few or many, please let me know and we'll add them to this page along with a note giving you credit for creativity. Contact me now. Everyone is different. Some people thrive on finding the most creative unusual name that best describes their dog and will kick out many names before they find just the perfect one. Others prefer the more familiar, common place names - the name that rolls of their tongue and may remind them of something in their past. Many people in this category prefer traditional girl or boy names. Still others decide that a name should be totally unique so they create a name that has never been used before. Kids are amazing when it comes to coming up with new, unheard of names. 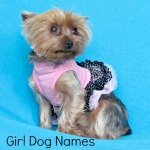 Are There Rules for Naming a Dog? The short answer is yes and no and let me explain. 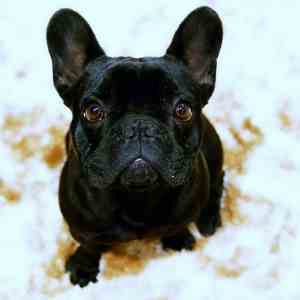 Most people will use terms such as sit, down, come and stay to teach basic commands. They will combine the dog's name with the command, such as "Toby, Sit." 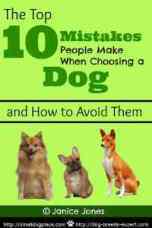 It is best to choose a name that does sound too similar to a basic command such as "Doug Down" or "Bay, Stay"
There will be times when you need to call your dog in public whether it's at a dog park or from your back porch. Choose something that is easy and comfortable to say. (Cooper, Leave it.). Avoid anything that might be embarrassing or offensive to anyone. 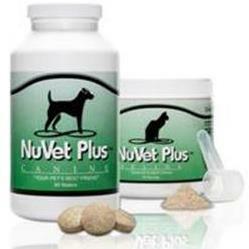 Most puppies pick up their name quickly if you use it frequently and enthusiastically. But short is normally better for dog names. That doesn't mean you need to choose a one syllable name like Dot. Rather keep the syllables to a minimum of three or less. 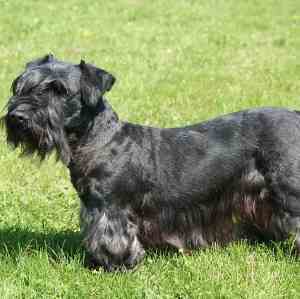 For example, I personally love the name Borealis (Northern Lights) as a black dog name. It reminds me of a natural beauty that few get to experience. But the word Borealis is four syllables and may be too long to use. You can shorten names and Borie might make a good name. Aye Aye - A small mammal found on the island of Madagascar. 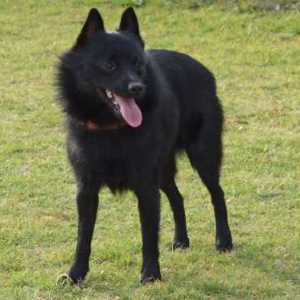 Domino - A good name for a predominantly black dog with a little white. Noche - means night in Spanish. Penguin - Black land and sea bird; Could be used for a black and White dog. Rorschach - Remember the Rorschach ink blots from Psychology 101? 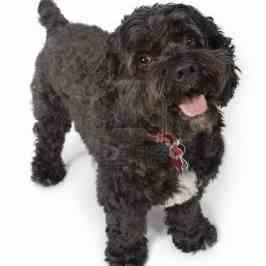 Velcro - Black Velcro makes a great name for a little black dog that won't leave your side. I found this name has both Nordic and Celtic origin and has meanings ranging from Raven, Raven haired, Little Raven,Raven haired beauty, and even another meaning "little beacon on a hill" and even "little teardrop." For an in depth explanation and historical perspective of the color black, check out this wikipedia article. 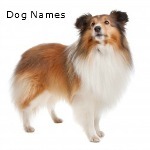 Need a formal name to place on your purebred dog’s registration paperwork? Practically anything goes in this regard but must not exceed 50 characters including spaces if you are registering with the American Kennel Club. Otherwise, you will pay more for your name. Any name you choose will be subject to approval with AKC. You do not need to choose two entirely separate names, one informal and one formal. You can start with one of the names below and add to it to come up with a unique dog name to register. For example, say you want to name your dog Thunder, a formable name for a tiny dog. Your registered name could be Josie’s Passing Thunder Clouds. 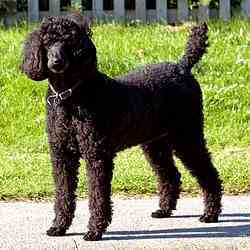 Have a suggestion for a black dog name. Take a moment and add it to our ever growing list. Use the form below our list of black dog names to submit your ideas. We will evaluate any name for appropriateness on this site and add accordingly. You are also welcome to add photos and a short story about your favorite black dog. 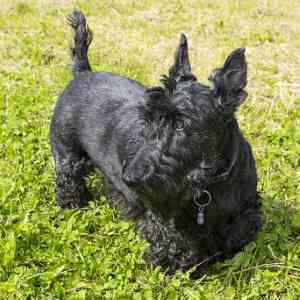 Have a great name or story to tell about your Black Dog? We’d love to hear it. Use the form below to tell the world about your favorite black dog. 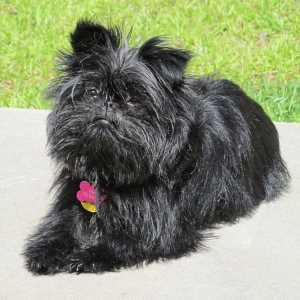 There are many small breed dogs that are black. 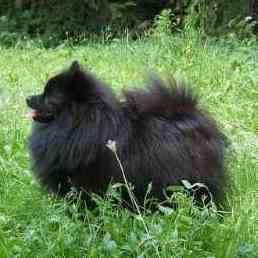 Do you have or have had a small black dog. We'd like to hear about your dog? What is your dog's name? What breed? What are some special characteristics about him or her that makes them unique? Does he do tricks? 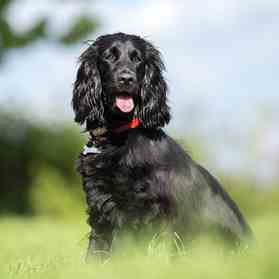 Do you have a great story about a black dog Please share it. Don't forget to upload some photos. Izzy is a very popular name for a human so what about Tizzy. Didn’t find the perfect name? 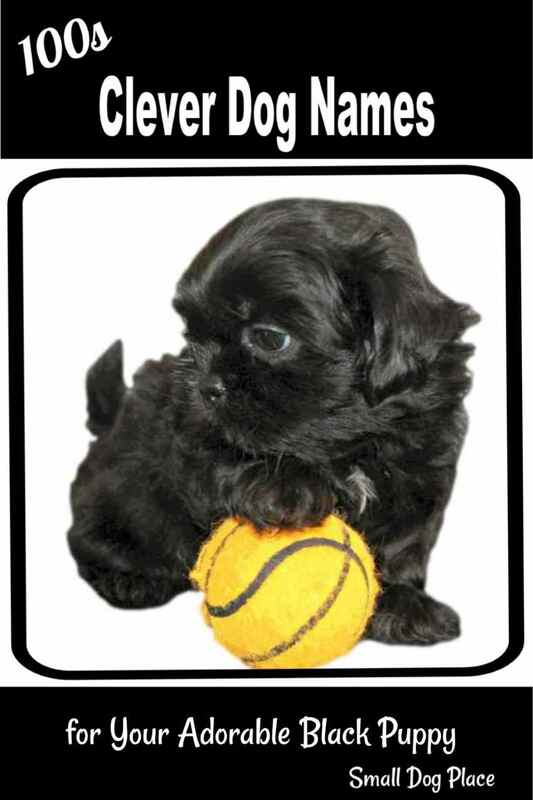 Check out our other dog name pages for additional ideas to help you name your dog.